A Day for Everything in Ohio! – Let's Go RVing! A Day for Everything in Ohio! Saturday we kind of rested after we got to Coshocton. Sunday we were late getting started and just managed to see Roscoe Village and take a ride on the canal boat. Today, we made up for it. 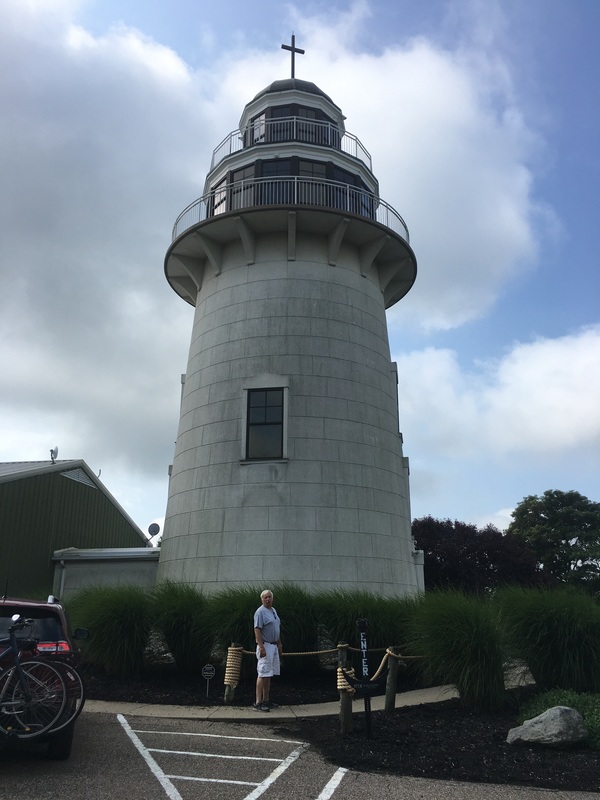 We visited the only inland lighthouse in Ohio, found a covered bridge, went to a cheese factory, toured an Amish farm and went to the Football Hall of Fame in Canton – all in one day and we didn’t even leave the campground until 10:00. Oh, did we take time to eat? Nope, not all day! Our first stop was the only inland Lighthouse in Ohio, the Gospel Hill Lighthouse located in Warsaw, Ohio at Gospel Hill Church. The minister had a vision from the Lord in 1976 to build a lighthouse for others to see the light of Jesus but it was not until 2002 that it was erected. The story of the construction was quite interesting and involved many people from engineers, to silo builders, state inspectors, and electricians to name a few. It was amazing to see how the pieces fell into place as the planning and construction progressed. Obviously the Lord was in charge and He opened many doors for this lighthouse. It’s not a terribly tall lighthouse rising only 74 feet to the top of the cross, 65 feet to the top of the dome, a 7 foot cross on top and a 2 foot ball that the cross sits on. The cross is pointed directly to the road coming in. There are three levels and on the second level is a prayer section where members gather to honor prayer requests. I stood behind to give some perspective and depth to the sculpture. Outside is a building where Saturday night singing is held every other Saturday night. 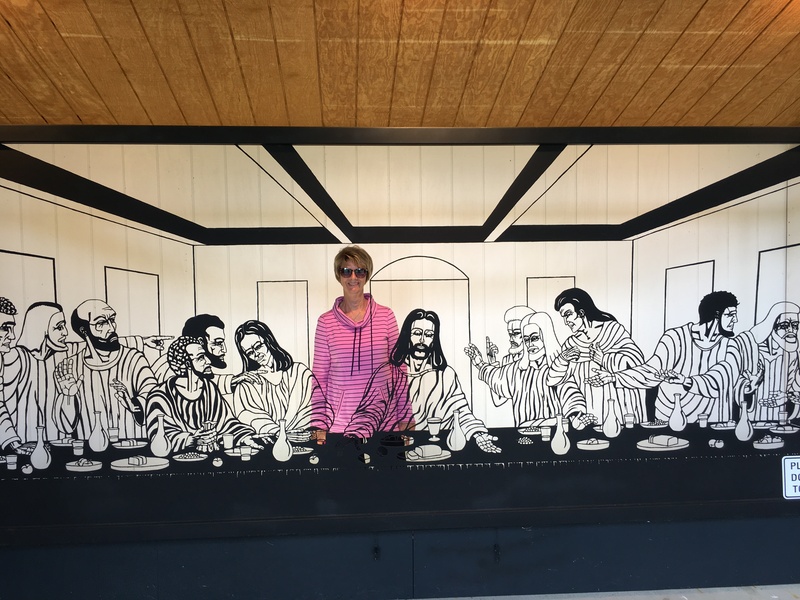 The backdrop for the stage is a steel image of the Last Supper. It is indescribably beautiful and touching. The gentleman who built it was near death and called the minister asking him if he would take it because he didn’t want it included in his estate. Amazingly the image was built in just 2-3 months. It is cut from a four foot by eight foot sheet of 3/16” steel and was all done freehand. If we had done nothing else today the day would have been great! Glad we were in the car and not the motor home! Our next stop was one of the covered bridges in Ohio. Well, I think I have found out the difference in a state maintained road and a township maintained road. Also, it has been a while since we’ve been on a graveled road adventure so we were due and today was the day. We wound and twisted up and down a sometimes narrow hilly lane hoping we wouldn’t meet anyone. We saw few houses, no cars and no people but we found the bridge, Hemlick Covered Bridge. 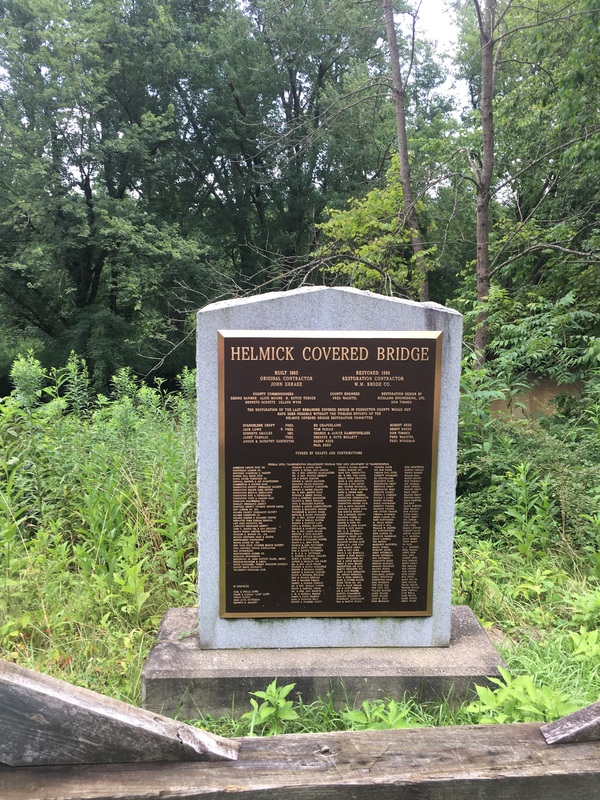 Originally built in 1863, the bridge was a fundamental part of commerce for the village of Helmick. During those early days it provided access to two grist mills that were used by farmers from as far as 25 miles away. As a result of decay the bridge was closed in 1981. Citizens raised over $250,000 to restore the bridge completing the project in 1996. 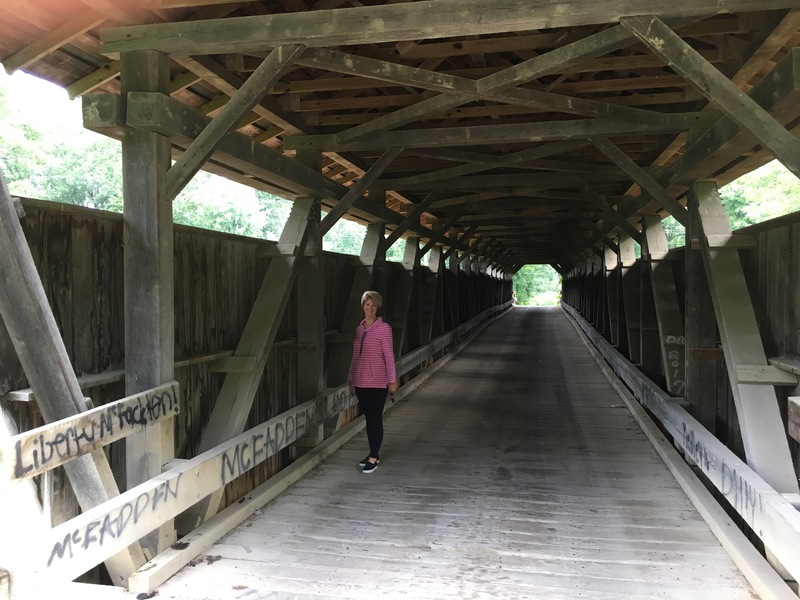 Today it is one of Ohio’s oldest covered bridges and the only one in Coshocton County. After taking a couple of pictures we realized in order to continue our trip to Canton where the Football Hall of Fame was located we were actually going across that bridge! The only posted warning was to not use it when it was flooded. Well, duh! We continued on and arrived in Millersburg. 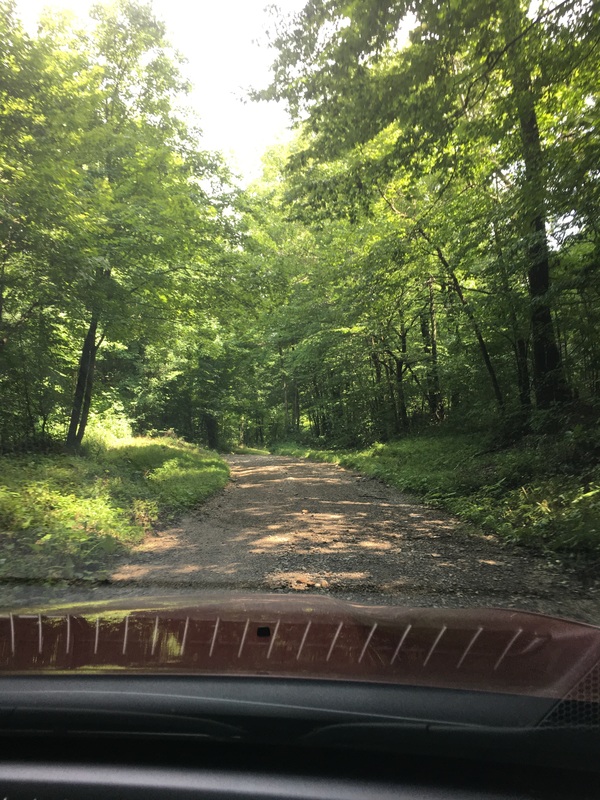 I had commented earlier that there were several interesting things to do in Millersburg so we decided to try some of them out. Our first stop was the Guggisberg Cheese Factory. We thought we were going on a tour but there were no tours because of the open vats. We sampled some of the delicious cheese and ended up buying two different kinds, an Amish butter and a buffalo wing cheese. Both are really tasty. Because they are vacuum sealed we could buy them today and leave them in the car while we wandered around the rest of the afternoon. 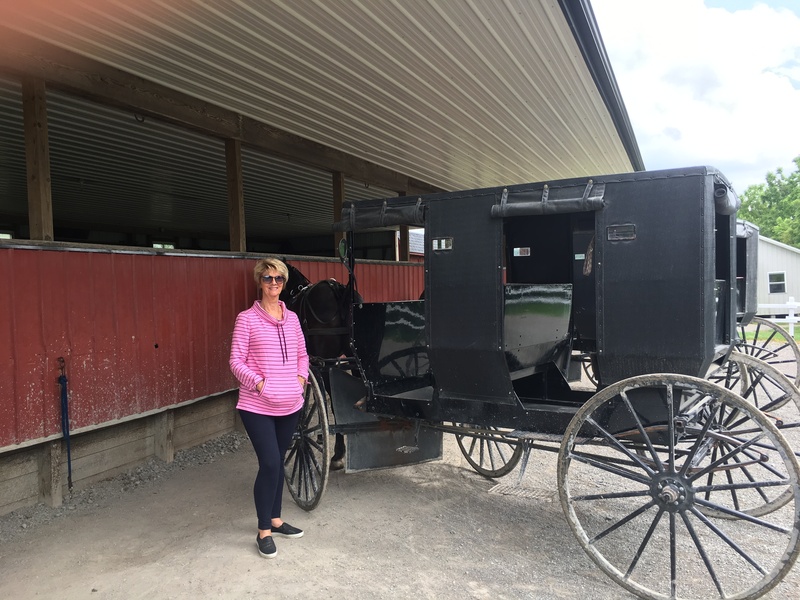 We then decided to go to Yoder’s Amish Home which was a tour that included two Amish homes, a tour of the barn, a buggy ride and a tour of the schoolhouse. We learned even more about the Amish from our guide. In Holmes County there are nine orders of Amish, the most conservative being the Swartzebtruber. They are very strict and very self sufficient. Of course they use no electricity and have no running water in the house. Often their yards have fruit trees and berry bushes which serve as some of their food. They wear very plain clothes, dark colors with no patterns. Their dolls have no faces because they see dolls with faces as graven images or idols. Among the other orders are the New Order which is the least conservative and the Old World who are sort of middle of the road between the New Order and the Swartzetruber. 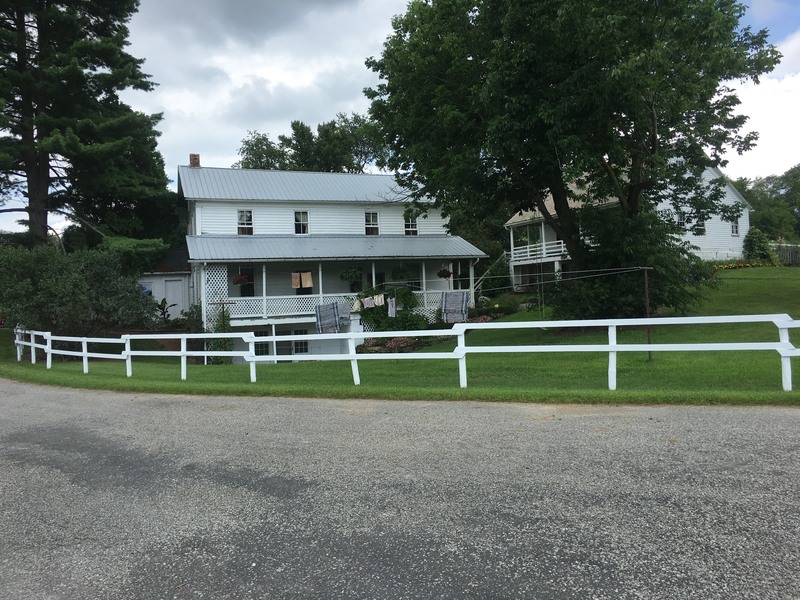 The Amish children can either go to a public school, a public school that has the Amish separated or a parochial school which only goes up to 8th grade and is taught by one of the Amish. They do not have to be certified. The teacher we talked with likened it to home schooling. All Amish children must learn to read German as that is the language their Bibles and music are in. Pennsylvania Dutch is spoken in the home. Church is held in the homes and meets every other Saturday. They have a truck full of pews that is delivered to the hosting home each week. Since there are no instruments all music is acapella and sung in unison. Jerry and I had noticed that a number of homes had solar panels so we asked about that. We knew they couldn’t be used for electricity since the Amish don’t have that. The panels are used to charge batteries that can than be used for washing machines, sewing machines, etc. After a short tour of the barn which was full of various animals, e.g puppies, bunnies, horses,, foals, miniature ponies, sheep and goats we went over to the buggy ride. It wasn’t a long ride but it was nice. I sat in the front with the Amish gentleman who drove the horses. He was very polite and we chatted for a bit. A short visit to the school house where we chatted with a teacher and then it was time to end our sightseeing for the day. 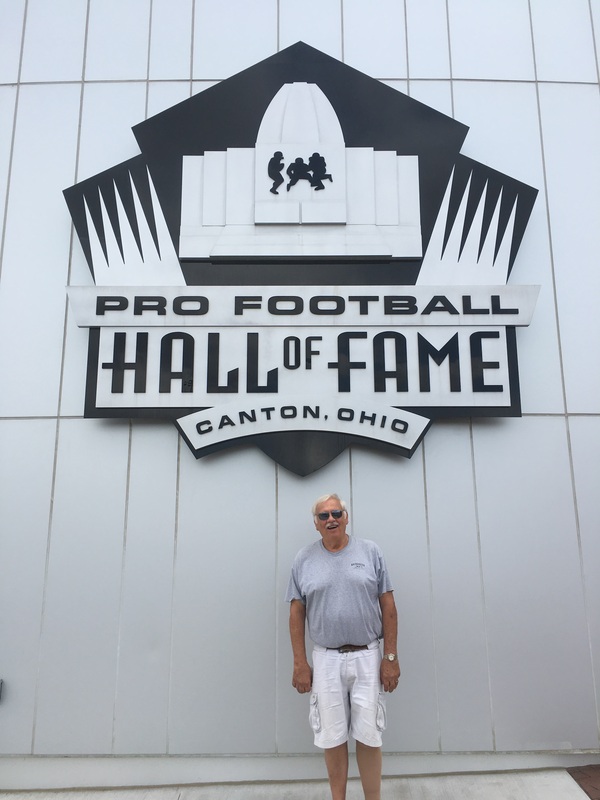 Our original plan was to go to Canton but we began to see that that trip probably wouldn’t happen so I suggested that we leave from Coshocton Tuesday morning, spend the night in Canton and visit the Football Hall of Fame. When we realized that it was 4:00, Canton was only 45 minutes away and the Hall of Fame stayed opened until 8:00 we decided we could make it so off to Canton we went. The Pro Football Hall of Fame is very impressive even to someone like me that knows little about football. We entered through panels of football cards and the worth of each was explained. Boy, I wish baseball cards were that valuable as we have boxes and boxes of them! We watched two videos, one with “joe Namath” narrating. Good but loud. The second video was the Road to the Super Bowl. He recapped the 2017 game between the Patriots and the Falcons. Even though I knew the outcome of the game, I was sitting on the edge of my seat during the entire game as the Falcons led most of the game. A full day and the only thing we left out was eating so as soon as we got back to the coach we scrambled some sandwiches together. Not exactly a full meal and not exactly filling but it worked. Off tomorrow to Fletcher for the annual Blue Ridge Classic Horse Show. Any wonder why we were concerned about driving over this bridge?